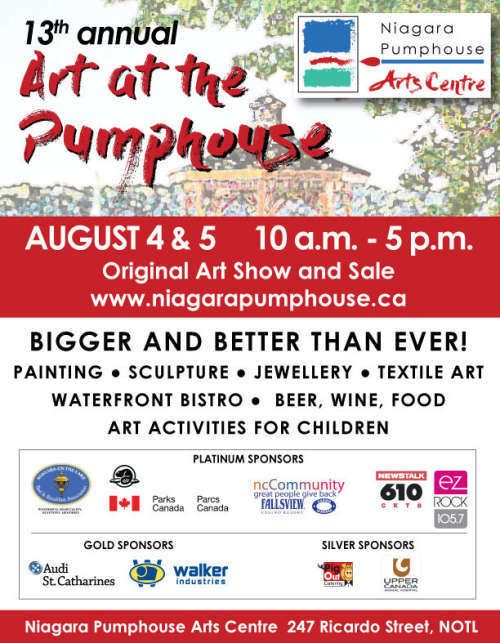 The Niagara Pumphouse Arts Centre welcomes you to its 13th annual juried, original art show and sale. Sixty professional artists from across Ontario, exhibiting a wide range of original, hand-crafted works including paintings, photography, sculpture, jewellery and more. FREE Admission. Rain or shine the show goes on! We welcome back returning artists and look forward to showcasing some new artists. A waterfront Bistro will feature food, wine and beer for sale. Plenty to see and do both outdoors on the picturesque grounds along the Niagara River’s edge, and inside the Niagara Pumphouse heritage brick building, the oldest surviving pump house in the Niagara Region. The abandoned water pumping station (circa 1891) was purchased by the Town of Niagara-on-the-Lake, and through community effort and fundraising the building was restored and converted to become the unique Niagara Pumphouse Arts Centre. The original pump, which once supplied water to the Town of Niagara on the Lake, remains on display in the garden. The Niagara Pumphouse Arts Centre is located at 247 Ricardo Street, Niagara-on-the-Lake. It is a registered charity. Why not stay at one of Niagara-on-the-Lake’s beautiful bed and breakfasts, inns, or vacation rentals and make a getaway out of it? Book your getaway at Bookyourstay.ca.